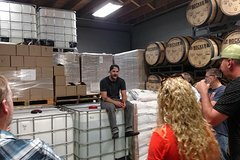 Get out of the hustle and bustle of downtown Denver and spend 4-hours on this small-group (up to 13) tour of 3 local beer distilleries. Your guide will take you to each location where you will spend approximately 1-hour at each distillery. Learn about distilling from the experts while you enjoy a flight or cocktail at each stop. Tour includes van transportation and at least one distillery tour. You will meet your group inside the Brew on Broadway (The BoB) at 5pm. There is public parking across the street from the Bob (Between Broadway and Lincoln). There is usually street parking on Broadway as well. 2. Distiller tour at one stop included in the tour. Learn about distilling from the experts.